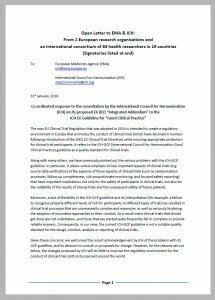 The letter has been signed by 119 leading trialists from 22 countries and by 5 research organisations. A list of their names can be found on our supporters page (along with those new supporters who have joined more recently). 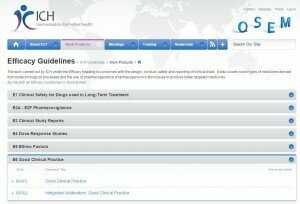 The ICH-GCP guideline – what is it? 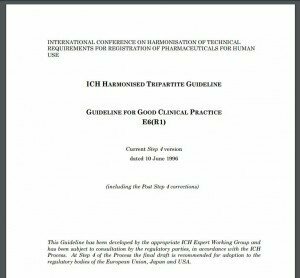 The ICH-GCP guideline is short for the International Council (recently changed from Conference) on Harmonisation (ICH) Guideline on Good Clinical Practice (GCP). ICH was created in the 90s by various drug regulators around the world to harmonise the approval process for new drugs. That is obviously sensible. The ICH-GCP guideline was then created in 1996 by those regulators and the pharmaceutical industry and was originally adopted in the US, Europe and Japan for the conduct of trials that would be submitted by companies to support applications for the approval of new drugs. This meant that a company could do a trial in one region, say Europe, and then use the data from that trial to get approval for the drug from regulators in another region, say the US. Again, that sounds sensible and much of the work of ICH to harmonise the development and approval of new drugs is helpful and entirely appropriate. But, what was never sensible were the fundamental problems with the ICH-GCP guideline which we and others have repeatedly highlighted, but which ICH and drug regulators have, until very recently, largely ignored. But this is not just a problem about a document, the ICH-GCP guideline, it is about a much larger problem. The bigger problem is the lack of a proper process of consultation, dialogue and debate about the ICH-GCP guideline that reflects the key strengths of randomised trials and how modern trials are done today. Unfortunately, ICH still operates in a way that apparently only serves the interests of its two founding parties, drug regulators and industry with everybody else, including patients and the public, largely ignored. This bigger problem is about a lack of transparency and openness in ICH itself, which you can read more about here.